After reading various restaurant publications, articles and economic forecast reports discussing the state of the restaurant industry, I created an executive summary that distills relevant information for those looking for a 2018-focused economic outlook for the restaurant industry in California. In high occupancy cost areas such as the San Francisco Bay area, including San Francisco, Silicon Valley, and many parts of Southern California, many restaurants are being forced out of business and in many cases these restaurants are being replaced by other types of businesses that can pay the high rents these areas are demanding. Increased minimum wage is reducing operators profit margins and operators can’t totally offset these increased costs to the customer as they need to maintain a strong price value experience for their customer or they will lose their customer. 2018 has prospects for continued strong economic growth-stock market looks strong (although there is a good chance for a correction), unemployment rates are low (which is not good for the restaurant business as it is challenging enough to find good employees); and perhaps the new tax bill will put more money in consumer’s pockets and their discretionary income will increase and perhaps they’ll be able to spend more money for food away from home. Specifically, what does the restaurant industry in California look like in 2018 for buying and selling restaurants. Unit sales generally for restaurants are going to be flat compared to 2017. Many ethnic concepts are on the rise in popularity. In San Francisco in 2017 approximately 300 new restaurants opened and approximately 400 restaurants closed. In past years as much as a half of our total listings were in San Francisco and today approximately 5% of our total listings are in San Francisco as it is such a challenging environment to do business in – wage and occupancy costs through the roof, shortage of employees as employees can’t afford to live in the city, san Francisco gross receipts tax, onerous sick pay policies, San Francisco’s health requirements, no formula ordinance law ( no chain with 10 or more units can open in many parts of the city), etc. make it difficult for restaurants to survive. I have a client who did $4.5 million sales in 2017 who had been at his location for 17 years and he just vacated the location after his lease expired 12/31/17 as his rent was going up 30% and he was barely breaking even at $4.5 million sales. I know of many restaurants doing $2,3,4+ or more million dollars of sales a year that are not making money. The above problems in high operating cost environments in the San Francisco Bay Area are also present in many high cost cities in Southern California. Online restaurant sales are growing dramatically especially among millennials removing many customers from occupying seats in restaurants. Millennials and others prefer to eat their meals at home and order their meals from their favorite restaurants through delivery services such as Uber Eats, Door Dash, Caviar, Grubb Hub, Amazon and Postmates. I recently obtained a listing the other day from a restaurant doing approx. $1 million in sales. In past years the majority of these sales were in house sales and now 70% of their sales are on line sales so they can’t justify having a brick and mortar location for $300K in sales and will service the $700K of online sales in their commissary. Amazon’s recent purchase of Whole Foods will undoubtedly contribute to more on line sales and fewer seats being filled in restaurants. Additionally, services that prepare home cooked meals and deliver them such as Home Chef, Terra’s Kitchen, Green Chef and Blue Apron, etc. are eroding restaurant sales. There is a continual price war going on in the restaurant business – most major fast food chains have cheap meal packages such as Mc Donald’s new $1, $2 and $3 menu’s, Burger Kings 2 whoppers, French fries and a drink for $5, Subways 12 inch sandwich for $5 and kids eat free at IHOP, etc. I went to Safeway the other day and had a 12 piece sushi package special for $5. Prepared meals in grocery stores are also heavily competing with restaurant sales and many of these grocery stores also deliver prepared meals to the customers home. So with the items discussed above, let’s take a look as to who are the 2018 restaurant sellers and buyers. Who are the restaurant sellers in 2018. 1. As has been the case in past years it will be the struggling operator who is undercapitalized that is either marginally profitable, losing money or is the process of being evicted and/or the verge of filing bankruptcy. 2. Baby boomers who can’t physically or emotionally deal with the trials and tribulations of the day to day pressures of running a restaurant. and taxes further squeezing the operators margins. 5. Operators that have health issues that must sell as they physically can’t operate the business any longer. Also, obviously operators that die that don’t have any heirs or partners to continue the business. technology to compete – POS systems, ipad ordering systems, new reservation systems, etc. 7. Successful restaurant owners that are burned out mentally and want a different life style from having to be on 24/7 emotionally. 8. Regional chain operators and franchisees with underperforming units. and are sick and tired of dealing with the corporate bureaucracy and want to be their own boss. 2. Foreigners trying to get monies out of their unstable countries who are trying to get immigration visas. bank financing and or seller financing. 5. Regional chain buyers that already own several restaurants and want to expand their concept. 6. Parents of children who are working in a business and their parents lend or give their children the money to purchase the business. 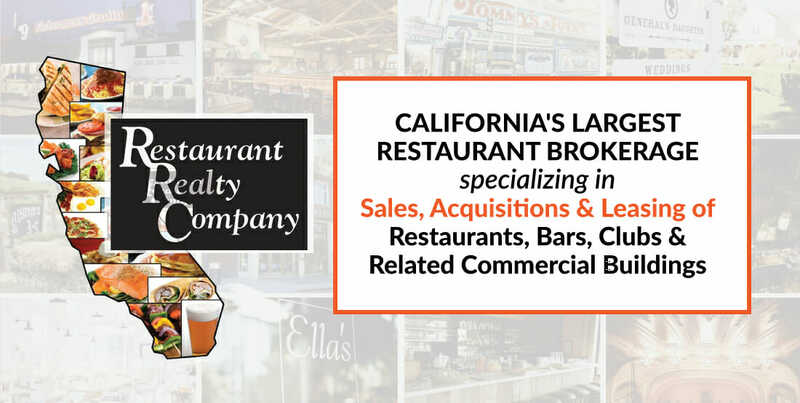 Restaurant Realty has the largest inventory of California restaurant, bar, club and related commercial building opportunities as well as the largest proprietary data base of buyers for these opportunities. If you are a seller or buyer please contact us by going to our website -www.restaurantrealty.com or call us at 888-995- 9701. Why You Need to Work with a RESTAURANT DEALMAKER to BUY or SELL a Restaurant, Bar, Club or Related Commercial Building.